Before going to Sophia High School, Mt Abu, I was not too fussy about my vegetables. I pretty much ate whatever my mum cooked. Living in a large family, one did not have the luxury of being fussy. Whatever was served, one ate. However, taste buds changed the minute I stepped into the dining hall of the boarding school in Mt Abu. My once favourite vegetable became my enemy. 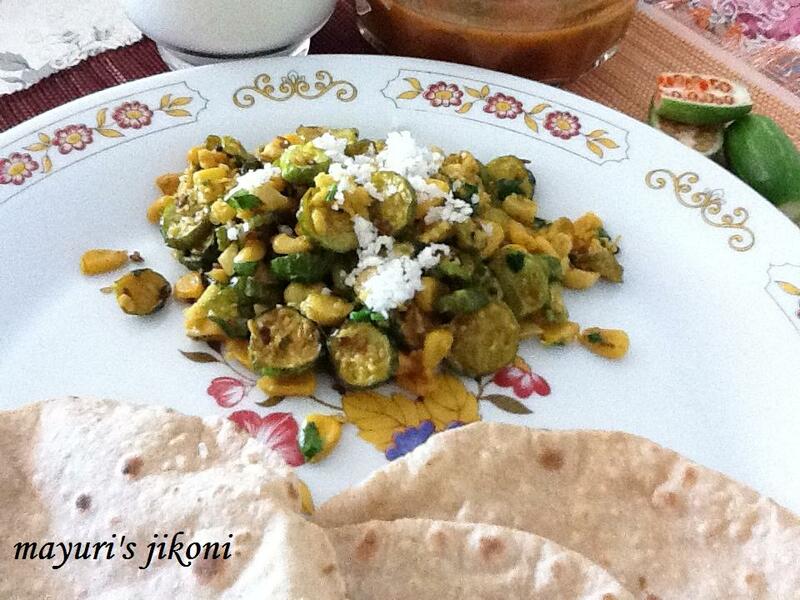 I loved the way my mum made tindora or ivy gourd (indian gherkins) in a simple gujju manner. But at school it was just a mass of boiled tindora with no flavour and just too soft for my palate. So there began a mission to get rid of the tindora as fast as one could….hide it under the table, hide it under the blouse with a bit of chappati to feed the dogs and birds or passing it on to a friend or class mate and in return promising to eat the veg she didn’t like. Most of the times I got caught and had to eat a double serving of the yucky vegetable. Once I was out of boarding school and back home, I refused to eat the dreaded vegetable. However, things changed again when I got married and I just didn’t have the guts to tell my mother in law that I hate tindora. So there, during lunch took about a tablespoon of it and actually began to love the vegetable slowly. Now eating tindoras is no problem, as long as its not overcooked and tasteless. I love making tindora with corn and it is different from the usual style of just cooking it with dry masalas and spices. Hope you enjoy this version of shaak (vegetable). Wash and wipe the tindoras (ivy gourd) thoroughly. Slice them(rounds) not too thin and not too thick. Heat oil for frying in a wok, frying pan or karai over medium heat. When it becomes hot, add batchfuls of the sliced tindora and fry them till they are slightly crispy but not browned. Remove the fried tindora with a slotted spoon and keep it on a kitchen paper towel so that the excess oil is absored by it. Finish frying the remaining tindoras. Heat the 2 tbsp of oil in a wide pan over low heat. When the oil is hot, add mustard, cumin and sesame seeds to it. When the seeds begin to splutter, add the cashew nuts and stir fry for a few seconds. Add ginger and chilli paste, asafoetida and the coconut. Stir fry for a few seconds. Add turmeric powder , chilli powder and the fried tindoras. Mix well. Add salt, sugar, dhana jiru and mix well. Stir fry for a few seconds. Turn off the heat. Add the lemon juice and mix well. Garnish with coriander and coconut and serve with hot chappatis or parathas. Do not use the deep red tindoras as they do not cook too well. If you want to make this vegetable for guests, fry the tindoras the previous day and keep in the fridge. Stir fry with the rest of the ingredients before the guests arrive. Add more nuts if you like. Don’t buy large tindoras as they may not cook too well.